Your business will fall short with Shopkeep's limited eCom. Our built in-house solution runs your entire store from a centralized interface - the way it should be. Shopkeep is missing this core retail feature. With Lightspeed, you can create purchase orders and instantly send them to the vendor with a single click. 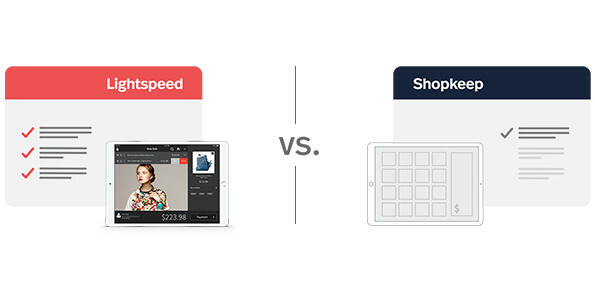 With Shopkeep, you're stuck using an iPad. With us, you can access your store, sales, and customer data from a Mac, PC, iPad or tablet wherever you go. Growth with Shopkeep is limited. Lightspeed lets you easily add locations, transfer inventory across multiple stores and centralize purchasing. Shopkeep simply doesn't support this. Lightspeed lets you order products that aren't in stock and put them on hold for customers, all for free. Sell serialized items, create product bundles and easily organize products with multiple variations. Run your business online and in-store using one centralized inventory. An item importing tool is included within the system, allowing you to create, update and validate items in bulk on your own. Order products you don’t have in stock or set them aside for your customers, no module add-ons required. With integrated eCommerce built in-house, run your entire store from one centralized system and have a single view of inventory, customers and reporting. Easily access industry specific vendor catalogues directly from your system’s backend with over 8M pre-loaded items. Create purchase orders and send them directly to the vendor within the system. Transfer inventory across multiple locations and centralize purchasing. Expanding? Easily add a location to your current system. Track both in-store and online customer shopping habits from a centralized interface. Access detailed sales and performance data. Run your business from your Mac, PC, iPad or tablet and access all your sales and customer data anywhere you go. Get personalized training and 24/7 phone, email and chat support included with purchase. Track work orders and manage repairs with a free built-in service module. What if we told you Lightspeed will not only provide you with a single system to run your entire business, but our customers see a 20% increase in revenue just in their first year. New businesses choose Lightspeed for ease of use, but stay with us for consistent success and growth. Is your current system holding you back? Don’t sweat the switching process; there’s no downtime and you won’t lose any of your product, customer or vendor data. Our import tool does the work for you and our onboarding team will be with you every step of the way to make sure you hit the ground running. The best part? It’s all free.